Proponents say the new law school established at the university in downtown Toronto could help reduce the number of Canadians heading abroad to attend law school, according to professors and lawyers who helped design or approve the program. Lawyers with a better grasp of business and technology will be more marketable and help address access-to-justice issues, say supporters. However, other lawyers question whether Toronto needs a new law school when graduates face a job shortage and high debt load. Jan Weir, a lawyer who teaches business law at the University of Toronto’s management school in Mississauga, Ont., says most of his third-year business students tell him they’re not considering law school because they feel they can’t afford it. There needs to be a whole new approach, Weir says. Focusing on training generalist lawyers is just an “elitist” iteration of a model that’s existed for decades, he says. When it comes to cost, Ryerson has proposed a tuition fee of $20,000 per year for law students, which is “well below the tuition level of the two other Toronto law schools,” according to a report last year from the Academic Standards Committee of Ryerson’s Senate. For the academic year ending in 2017, annual tuition at Ontario law schools ranged from $17,866.37 at Lakehead University in Thunder Bay, Ont. to $25,973.40 at York University’s Osgoode Law School and $37,734.82 at the University of Toronto, according to a report that Ryerson submitted in April 2017 to the Federation of Law Societies of Canada for approval of the proposed law school program. “The amount of tuition fees was a topic raised again and again in our consultations, with both students and younger practitioners in particular stressing the significance of the amount of tuition as an indicator of Ryerson’s stress on access,” Ryerson said in the FLSC proposal. According to Ryerson’s FLSC proposal, about 200 Canadians educated abroad seek licensure in Ontario each year. After hearing the debate over the approval of Ryerson’s law school proposal at the law society in February, Christopher Bredt, senior litigation partner at Borden Ladner Gervais LLP’s Toronto office, voted to approve the proposal for a law school at Ryerson. The Council of Canadian Law Deans says that, of the 23 law schools across Canada, there are eight that are in Ontario: Lakehead University, the University of Ottawa (civil and common law), Queen’s University, the University of Toronto, Western University, the University of Windsor and York University. Many graduates looking for work have also studied abroad. In its report to the FLSC, Ryerson said that, between 2005 and 2014, the ratio of internationally trained law candidates to those from Ontario law schools applying for licensure in the province rose to 37 per cent from seven per cent, mostly due to students from the U.S., U.K. and Australia. Statistics pertaining to Canadian students from outside Ontario were not available. Ryerson proposed to the FLSC a class of 150 students in the first year of the program. There are 4,000 to 5,000 candidates actively completing the licensing process in Ontario throughout the year, according to the law society’s dialogue on licensing report. Angela Chaisson, a sole practitioner in Toronto, does not support the creation of a new law school. She says that after being a guest lecturer at Osgoode and the University of Toronto, she has received emails from students offering to article for free due to the lack of other options. The level of provincial funding for Ryerson’s proposed law school is yet to be decided, according to spokeswomen from Ryerson and the province’s Ministry of Training, Colleges and Universities. A Ryerson spokeswoman said in a statement that its model of tuition will be revenue-neutral and law school expenditures will be covered through the revenues associated with enrolment in the law program. Chris Bentley, managing director of Ryerson’s Law Practice Program and Legal Innovation Zone, says he thinks Ryerson’s law graduates will have “no trouble getting jobs” because the required curriculum focus on technology and entrepreneurship will help them compete in new markets, such as consulting. Lorne Sossin, professor and former dean of Osgoode Hall Law School, York University, echoes that sentiment. “Graduates want to pay down debt, [have] the security of interesting work, but more than anything else, they are looking for the sustained engagement that may not happen with one line of practice . . . or narrow pathway in their careers,” says Sossin. 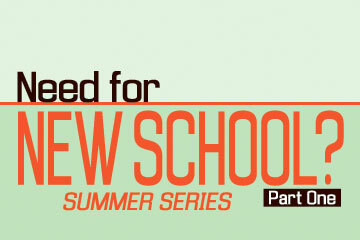 Next week, Part 2 of the series will look at the issues facing Ontario’s current law students. Amazing proposal! I wholeheartedly support it. I graduated from one of the Toronto law school, and neither I nor many of my classmates could find an articling position come graduation time, but the solution to everyone's woes is to open a new law school and allow 150 additional graduates to flood the market. Their argument is that this will reduce the amount of graduates going abroad, which is a foolhardy assessment. The grads going abroad didn't have the GPA and LSAT score to get into a Canadian law school for the most part, so there will always be people going abroad for backdoor options when they cannot get into a school in their home country. I suppose the solution is to have Ryerson Law School accept students with C averages and sub 155 LSAT scores. That should certainly do the trick. Hooray, what a victory for Canada! We finally have our very own Thomas M. Cooley Law School! Hey, how about a suggestion to the old folks making these decisions? How about asking current law students and recent graduates for their input, rather than relying on the information provided by old timers who are many years out of touch with the current state of the legal job market?